Bell & Ross, the official watch partner of the Renault Sport Formula One Team, celebrates the reopening of the French Grand Prix with its first presentation of a Vintage model from the collections linked to the partnership. 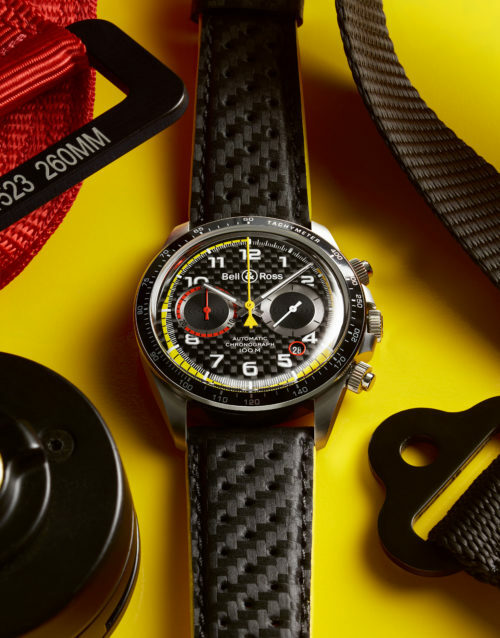 This new model immerses us into the world of motor racing adoption Formula 1 racing codes; featuring a 41 mm case in satin-finished steel, a carbon fiber dial and black and yellow in reference to the colors of the Renault Sport Formula One™ Team. Limited to 999 pieces, the Vintage BR V2-94 R.S.18 will captivate sensation seekers and fans of this sporting discipline and is available with a micro-perforated calfskin strap with carbon fiber effect and a yellow lining, or a bracelet in satin-finished polished steel.